Of course, it wasn’t enough to recreate the Battle of Helm’s Deep in candy. The brilliant, creative minds behind that project had to go and make The Battle of Pelennor Fields … in candy. It’s got it all — the white icing walls of Minas Tirith, the black licorice corpse of the Witch King’s mount. Gumdrop elephant war machines. A functional battering ram made entirely of licorice. A green marshmellow garden. And, of course, a heck of a lot of candy orcs. 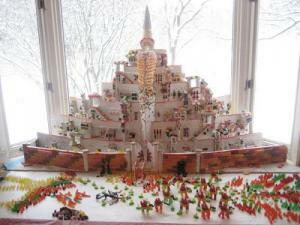 It’s an amazing project, and I hope they follow it up with some other confection creation this year.